This is the condensed version of an article entitled "ASSESSING ADHESIVE BOND FAILURES: MIXED-MODE BOND FAILURES EXPLAINED"
Field inspections of adhesive bonded joints cannot detect degregation of bond strength. Yet at the end of a "successful" inspection, the aircraft mechanic is to declare the aircraft safe to fly. Is this an impossible task? 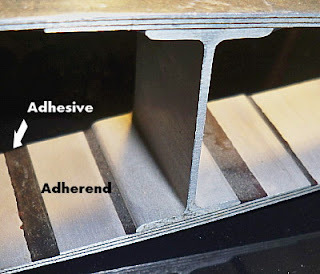 Adhesives depend on chemical bonds formed at the interface between the adhesive and adherend at the time the adhesive is cured. If chemical bonds are strong, failure occurs through the adhesive; bond strength is high. If the chemical bonds are weak or degraded, failure occurs through or near the interface; bond strength is low. For metals, hydration of the surface oxides by water is the most common cause of failure. For example, aluminum forms an oxide almost instantaneously when the pure metal is exposed to the atmosphere after etching or abrasion during the production process. A bond which is susceptible to hydration at the interface has short term strength that may be sufficient to pass certification and quality assurance tests. However, as time in service progresses and the interface gradually deteriorates; bond strength degrades and eventually fails even without any loads. Many current tests for process validation are based on static strength. For bonds which are susceptible to hydration, the chemical bonds at the interface are initially strong. It is not until the interface has begun to hydrate that there is a measurable loss of bond strength. Hence, short term strength or fatigue tests cannot prevent the in-service bond degradation and adhesion failures. Many structures pass certification testing and quality assurance tests, including NDI, therefore one could infer that these are sound structures. Yet these structures may be susceptible to hydration of the interface and subsequent failure in service. In later service, there is a potential for the adhesive bonds to dissociate so that the oxides can hydrate. This creates an interfacial failure of the adhesive bond. Moisture absorbed by the adhesive is sufficient to start hydration, and paints and sealants are not an adequate measure to prevent hydration because they simply slow down, not prevent, moisture absorption. Out in the field, NDI can only tell whether or not the bond has a physical defect, it can NOT determine the strength of the bond. NDI can therefore not detect the onset of bond strength reduction. Aircraft mechanics cannot assure the strength of bonded joints and it is up to the regulatory authorities and the manufacturer to recognize the limitations inherent in the inspection of bonded joints.